Vineyards and grape varieties: 2766.5 hectares (6836.2 acres), of which 59.3% Pinot Meunier, 27.9% Pinot Noir, and 12.6% Chardonnay. Villages and classification: 52 villages, of which 12 premier cru and 40 “autre cru”. Noted for: the northwestern part of the Montagne de Reims is included in this area, with good Pinot Noir and Pinot Meunier, mostly from north-facings slopes. The vineyards inside of Reims are also part of this area. Bligny: 164.4 ha (16% Ch / 5% PM / 79% PN), autre cru (83%) – not to be confused with another Champagne village in the Bar-sur-Aubois also known as Bligny. Google Maps view with the villages in the Vesle et Ardre highlighted. The premier cru villages are in yellow and the autre cru villages are in orange. The La Petite Montagne de Reims part is shown within red borders and the Vallée de la Vesle part within green borders. Map of the Vesle et Ardre area. Light green indicated the vineyards. The Vesle river (at the top of the map) runs from Reims and to the west, while the Ardre river (crossing the map from low right to top left) has its source on the Montagne de Reims hill and then runs in a northwesterly direction. The northern and northwestern parts of Montagne de Reims slope are located between these two rivers, on the right-hand side fn the map. The large and continuous stretch of vineyards from Gueux to Sermiers is the northwestern part of the Montagne de Reims. (In Villers-Allerand, the Grande Montage de Reims area begins and continues to the east, while Châlons-sur-Vesle is counted to the Massif de Saint-Thierry area). The picture belongs to the Union des Maisons de Champagne and is linked from their page describing Vesle et Ardre. Ardre is not a big river. Here at Faverolles-et-Coëmy. Picture linked from Wikimedia Commons (photo Vassil, 2008). The northwestern part of the Montagne de Reims, sometimes called “La Petite Montagne de Reims”, 14 villages, of which 12 premier cru. That part of the northern side of the Montage de Reims that is located to the west of the D951 road is (somewhat arbitrarily) not counted as part of the Grande Montage de Reims area, but is included in the Vesle et Ardre. These villages are mainly located to the southwest of Reims. 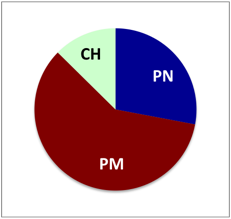 Here, the proportion of Pinot Noir (33.7%) is a bit higher than in the other two parts, but Pinot Meunier (51.5%) is still the most common grape variety. This is the only part of the Vesle et Ardre where there are any premier cru villages. Vallée de la Vesle, 10 villages/communes including Reims. Is located along the valley of the Vesle river, but only on its left bank. A couple of villages has a higher proportion of Pinot Noir or Chardonnay, but in general Pinot Meunier (56.3%) dominates. Vallée de l’Ardre, 28 villages. Is located along the vallet of the Ardre river, or its smaller tributaries. Most of the villages are located on top of the Montage de Reims hill rather than on the slopes down from the hill. Most of the villages of Vallee de l’Ardre are located in an area called the Tardenois, that also includes some non-Champagne producing villages further to the west. With the exception of one small Pinot Noir-dominated village, Pinot Meunier (67.8%) is the most common variety by a wide margin. This division into three parts is not official. Sermiers on the northwestern part of the Montagne de Reims, with Reims in the background. Picture linked from Wikimedia Commons (photo G.Garitan, 2012). I use the scheme from Union de Maisons de Champagne (UMC), since this is the only one I’ve found that really does include all 319 villages of the Champagne appellation and places them each in one of 17 areas, of which the Grande Montagne de Reims is one, that are in turn group into four subregions of the Champagne region. Of these 17 areas, Vesle et Ardre is probably the one with the least natural borders. This means that the borders drawn between Vesle et Ardre and two of its neighbouring areas, the Massif de Saint-Thierry and the Grande Montagne de Reims, need some explanation. The border between Vesle et Ardre and the Massif de Saint-Thierry area has been drawn through the Ardre river by the UMC. This means that only the left bank of the river (the villages south of the river), such as Jonchery-sur-Vesle, are counted as part of Vesle et Ardre, although the name of the area may seem to indicate that the entire Vallée de l’Ardre is included. The villages on the right bank of the river (north of the river), such as Châlons-sur-Vesle and Montigny-sur-Vesle, are counted as part of the the Massif de Saint-Thierry area. The border between Vesle et Ardre and the Grande Montagne de Reims has been drawn due south of Reims, along the D951 road, between on the one hand Sermiers and Villers-aux-Nœuds (in the Vesle et Ardre), and on the other hand Villers-Allerand and Montbré, that are included in the Grande Montagne de Reims. I consider this border somewhat arbitrarily drawn, since there are good premier cru villages clearly located on the Montagne de Reims slope on both sides of this border. In the expansion proposed for the Champagne wine region/appellation with 40 new communes (on top of the current 319, while 2 are removed), 3 of the communes are located in this area: Breuil(-sur-Vesle), Fismes, and Mont-sur-Courville. Communes are also proposed to be added just outside the borders of this area: Champfleury is added in the Grande Montagne de Reims (a neighbour of Villers-aux-Nœuds) and several communes will be added on the right bank of Vesle, in the Massif de Saint-Thierry are, including Baslieux-les-Fismes, Courlandon, and Romain. In the foreground the vineyards between Chamery and Sermiers on the northwestern part of the Montagne de Reims, the Chamery village in the background, and the vineyards between Chamery and Écueil in the distance. Picture linked from Wikimedia Commons (photo Pline, 2012). Current vineyard surface in Vesle et Ardre (as of 2013 according to CIVC) is 2766.5 ha (6836.2 acres), distributed over 1223 vineyard owners (exploitants) in the 52 villages. There are 1627.6 ha Pinot Noir (58.9%), 361.4 ha Chardonnay (13.1%), and 772.4 ha Pinot Meunier (27.9%). UMC’s new profile of Vesle et Ardre.